Eco-Harvester 2018 – 2019 Pricing & Special Reservation Offer!! 30% Down Payment Secures April/May 2019 Delivery and Saves You $3,500 ! The Eco-Harvester is selling faster than we can make them which is why for the fifth consecutive year we are providing our Special Reservation Offer. Due to recent import tariff increases in aluminum costs, the 2019 Eco-Harvester will increase 5 % from $69,999.00 to $73,498.00 but you can still purchase at the 2018 price ($3,499.00 savings!) with your 30 % down payment. Your down payment must be received no later than December 31, 2018 which secures your place in line and guarantees (April/May, 2019) delivery. Call us or fill out contact form for more information. 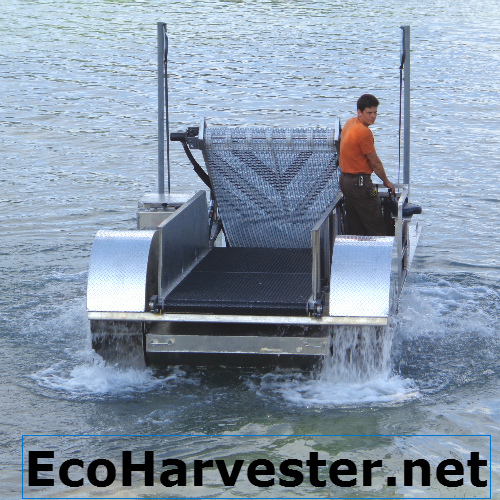 Why do Lake Associations and Lake Management companies choose the Eco-Harvester? 1. Better Alternative than using Herbicides & Chemicals for Lake Weeds! 2. Proven method to rid your lake of invasive lake weeds like Starry Stonewort and Eurasion Milfoil, etc. 3. Dual purpose Pulling lake weeds & Skimming Algae blooms, Duck Weed, and floating weed mats/fragments.